If you dismiss soups as nothing more than a starter dish or one half of a complete meal, you're missing out on a warming and satisfying way to get your fill of vegetables, protein, antioxidants and a host of other nourishing nutrients. Soups are a great one stop meal. Not only are they easy to make (although not quick, if you are using dried beans) but full of flavor as well. 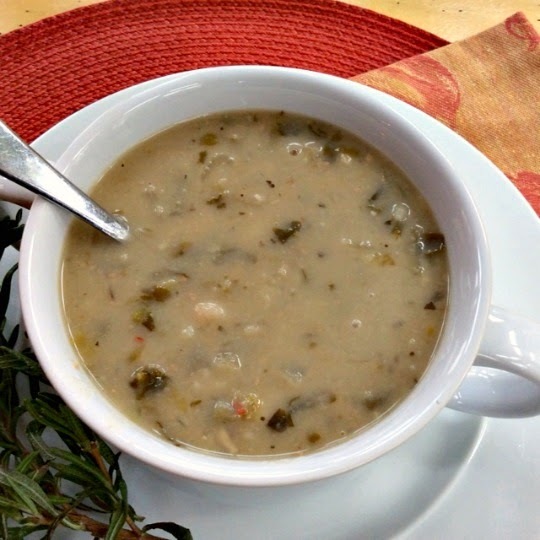 This recipe is for a White Bean and Escarole Soup is naturally both gluten and dairy free. Escarole is one of my favorite leafy green vegetables and although not a very common green, it is worth seeking out, as it adds layers of flavor to this simple soup. It is a member of the endive family but is less bitter than many other types of endive and has a complex flavor. Although you can use a different green in this soup (such as dandelion, kale, or even spinach), nothing will give you the same unique flavor that escarole will. Soak the beans overnight. Drain. Place the beans in a large pot with water to cover by two inches. Bring to a boil, then reduce heat to a simmer and cook until beans are completely tender, about 45 to 75 minutes. If you are not using them immediately, let the beans cool in the cooking liquid. If you are using them now, drain and reserve the liquid. Heat the olive oil over medium heat in a large heavy pot or dutch oven. Add the garlic, celery, leeks and red pepper flakes. Saute for 10 minutes. Add the escarole and cook for one minute, until it wilts. Add the beans, stock, tomatoes, pepper, and 3 cups of reserved bean cooking liquid. Bring to a boil, then reduce heat and simmer for 30 minutes. Add the basil and parsley and serve. Add salt to taste. You are right about soup being nourishing and satisfying. This looks like a hearty winter soup that is perfect with just a salad! Thanks for sharing. Thanks for linking up at our Gluten Free Fridays party! I have tweeted and pinned your entry to our Gluten Free Fridays board on Pinterest! :) I can't wait to see what you share this week! Thanks Cindy! I look forward to see all the wonderful recipes everyone shares on GF Fridays. Thanks for hosting! It would be a great day to enjoy this soup. Hope you are having a great day and thanks so much for sharing your awesome post with Full Plate Thursday. Thanks Miz Helen and thanks for hosting Full Plate Thursday! Have a great weekend! My family love soup, Phyllis and I know we would enjoy this. I love it when something so healthy and wholesome is delicious too! I've pinned your recipe. Thank you for sharing with us at the Hearth and Soul Hop. Thank you April! So glad I found Hearth and Soul Hop! Have a great weekend!